Autumn is here! I love this time of year. The leaves are changing, the air is crisp, Sukkot and Thanksgiving are fast approaching. It is most definitely my favorite season… in part, because of pumpkins! I can’t help smiling when I go to the grocery store and see gorgeous orange pumpkins piled high in the produce section. It’s the symbol of the season. The pumpkin originated in Central America over 7,500 years ago and made its way throughout North America before the arrival of Christopher Columbus in 1492. Native Americans cultivated pumpkins and prized them as a food source; because of their thick and solid flesh, they could easily be stored throughout the winter. Like other forms of squash, pumpkins are easy to grow. They became a favorite with immigrants to the New World, particularly in New England. Pumpkins were prized for their versatility; they were cooked into pies, stews, tarts, soups, and puddings. The flesh could be boiled or roasted, fried or mashed. Pumpkin seeds were dried and salted as a nutritious snack food. In the early 1800’s, decorative pumpkins called jack-o’-lanterns were carved to celebrate the autumn harvest season. In 1819, Washington Irving featured a jack-o’-lantern in his short story The Legend of Sleepy Hollow as the “head” of his Headless Horseman character, which likely led to the jack-o’-lantern’s association with the Halloween holiday. In the mid 1800’s, it became stylish to serve pumpkin pies for the Thanksgiving holiday, a trend that continues to this day. As you can see, pumpkins play a large role in American food history. 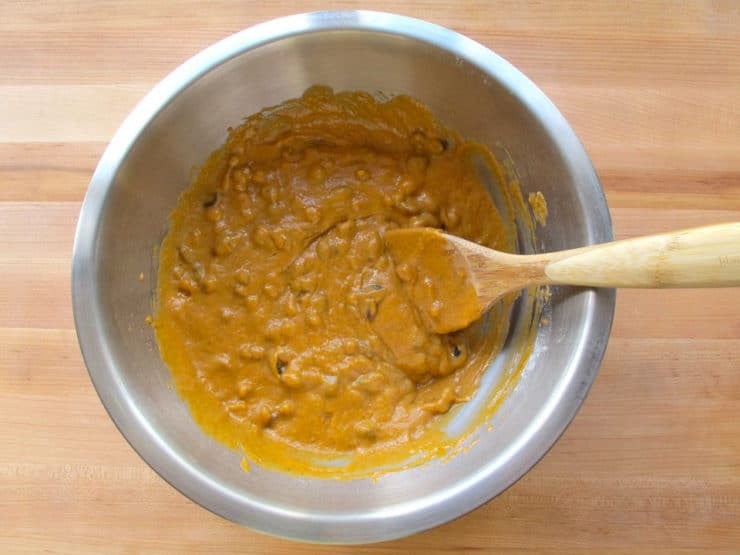 I love cooking and baking with pumpkin; the flavor is subtly warm and delicious. 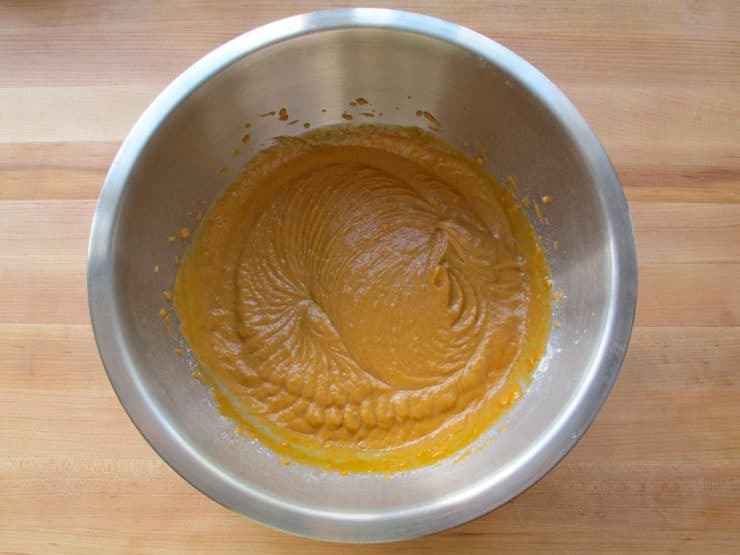 Pureed pumpkin adds gorgeous color and moisture to baked goods, and a special essence that just feels like fall. When combined with spices like cinnamon, nutmeg, ginger and cloves, pumpkin takes on a magical quality. Case in point, my Pumpkin Spice Cake (or quick bread, if you want to call it that). This delicious loaf cake is one of my favorite harvest-style desserts. When you bake it, your house will smell like autumn. It’s soft, moist, sweet, and delicious. Try topping a warm slice of cake with salted butter for a sweet and salty treat. Serve it with a steaming hot cup of your favorite tea or coffee. Heaven! 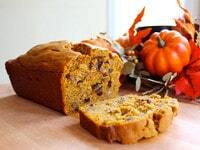 Pumpkin Spice Cake, a sweet loaf cake with pumpkin, raisins, cinnamon and spices. Sukkot, Thanksgiving, autumn, fall, harvesat. Kosher, Pareve. 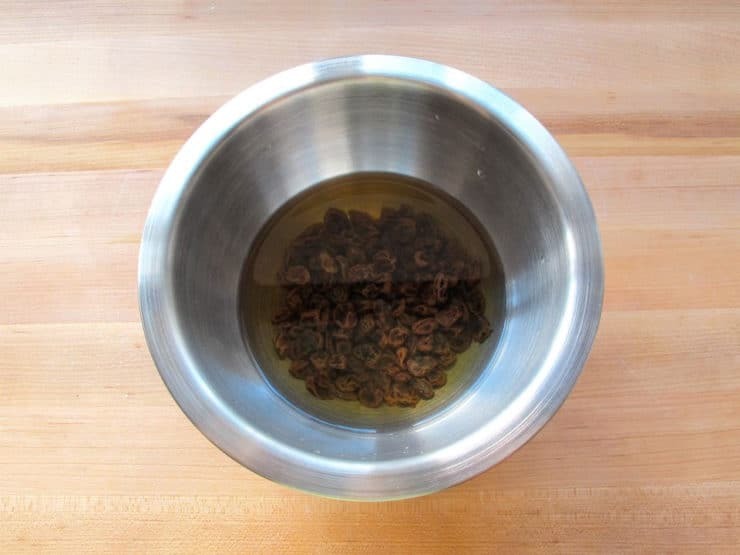 Place the raisins in a small bowl and cover with hot water. Let the raisins plump in the hot water while you create the cake batter. 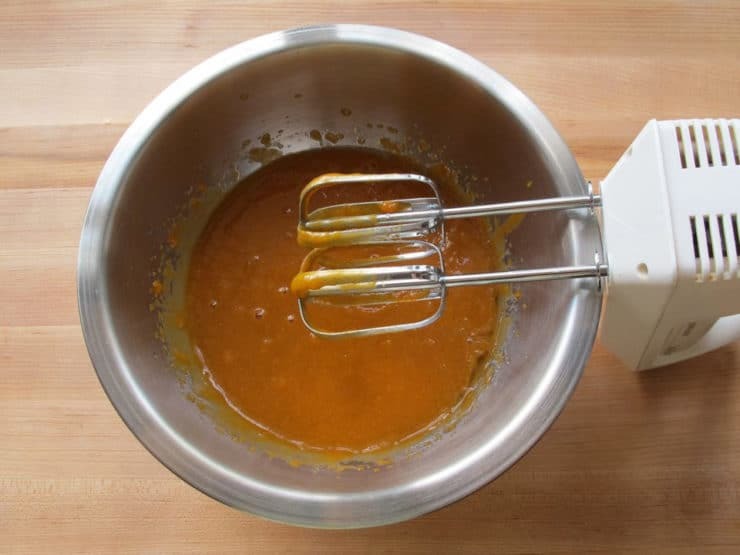 Use an electric mixer to mix together sugar, brown sugar, vegetable oil and eggs till smooth. Add pumpkin puree and vanilla. Mix again till blended. In a separate mixing bowl, sift together flour, baking powder, cinnamon, salt, allspice, nutmeg, ginger, and cloves. Pour liquid ingredients into dry. Mix together till blended. Do not overmix. Drain the raisins and pat dry with a paper towel. Fold the raisins and chopped walnuts into the batter. 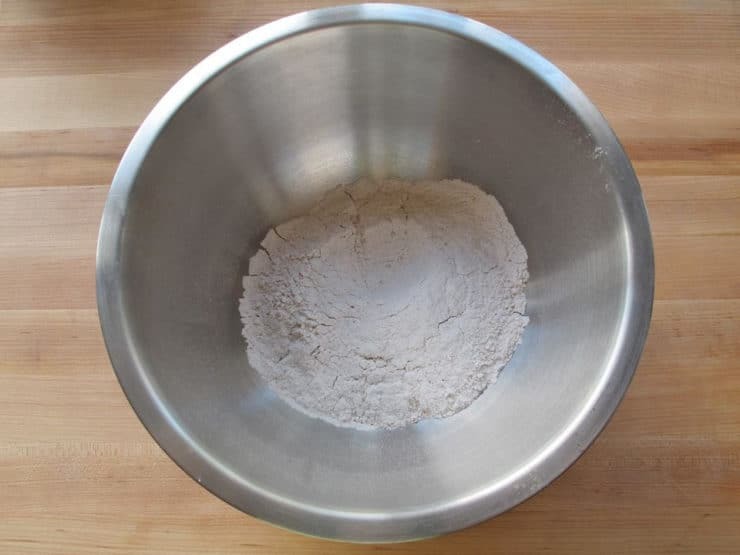 Grease a medium loaf pan. Pour batter into the pan. Bake cake at 325 degrees F for about 1 hour, until the edges brown and a toothpick inserted into the thickest section of the cake comes out clean. Remove from oven and let cool in the pan for 15 minutes. 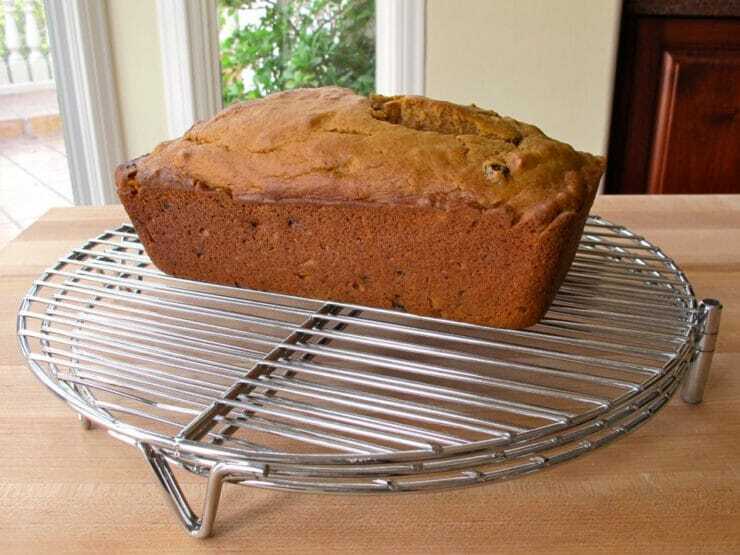 Gently release the cake from the pan and place on a wire cooling rack. Great recipe, everyone keeps asking me for the link. Allergic to nuts. Do I need to make any adjustments for not using nuts? Hi Anne, Tori’s assistant Ashley here. You can omit the nuts without any other adjustments. Yes it is. We are working on updating all recipes site-wide to display both US and metric measurements, it is a slow process as I have hundreds of recipes. I’m going to bake this tomorrow. Is this a bread or cake? Would I be able to bake it as a cake and carve it into a pumpkin shape? Also, will it work if I leave out the raisins? Hi Naeema, Tori’s assistant Ashley here. This recipe is for a cake. It’s quite moist so I’m not sure how well it would hold up to carving. You can leave out the raisins if you’d like. The cooking time for mini breads- I’m making a dozen all at once- is 40 min. At 325…take out -turn heat off and place them on top of the oven-cover with dish cloth till cool. I’m an avid baker- and the moisture and flavors were amazing. You have made my elderly neighbors Super happy! They are thrilled! Thank you! Glad it worked out for you Maria! THANKS for that info, I was just about to ask. Bake sale tomorrow and I’m making mini’s, can’t wait to taste them! What is the cooking time for mini breads? I’m making a dozen all at once! Instead of raisins i am thinking of using fresh chopped dates, what do you think? will they be too gooey? i have used recipe for a while not sure what i do wrong but it falls apart or breaks. i do use whole wheat flour as well as live in canada not sure if that makes a difference. Hi Lori, Tori’s assistant Ashley here. Whole wheat flour has a reputation for creating more crumbly baked goods, so that is likely the problem you are having. I would try using a combination of whole wheat and all purpose flour and see how that works for you. I’m baking this for the first time..It looks lovely. The method refers to 1 cup flour. Just wanting to check if it is plain flour or self raising flour? Hi Kellie! Tori’s assistant Ashley here. The flour used in this recipe is just plain flour. This has become one of my favourite recipes. I’ve baked it a dozen of times already sometimes adding different kind of dried fruit or candied ginger and using different kinds of pumpkin. Make sure to try your pumpkin puree, hokkaido tends to turn out pretty sweet, so you might have to reduce the sugar indicated in the recipe. Thanks a lot Tori for this delicious and beautiful cake! This was a hit with family and friends this year for the holidays !!!!! Your recipe made me a superstar because everyone loved it !!! I made it exactly as you wrote it and it was awesome. The fourth time (in one week) that I was baking it , I found that I was out of raisins and walnuts. I didn’t want to go to the store , so I used pecan halves and dehydrated apple slices that I chopped up. I put the apple pieces in a little warm apple cider to rehydrate them. That was a different spin on your recipe that also came out fabulous. Thank you so much for sharing your incredible recipe. I’m Swedish and live in Stockholm. We do not celebrate Thanksgiving here nor use pumpkin in cooking/baking. But I thought we’d try something for fun and found your recepie from picture googling pumpkin cake and after a few scrolls landed upon this. Really good…I chopped the raisins and increased the spices a little. That looks delicious; wish I enjoyed baking. I’m making this tonight…….after it cools down. Allergic to some of the spices. I only use cinnamon and ginger. Still tastes fantastic. this seems like the perfect recipe to make a healthy one. It’s so hard to find Jewish alternatives to the heavy sugary old traditional recipes. What if you replaced the vegetable oil for grape seed oil? And the sugar and brown sugar for applesauce, honey or molasses? And the white flower for whole grain flower? 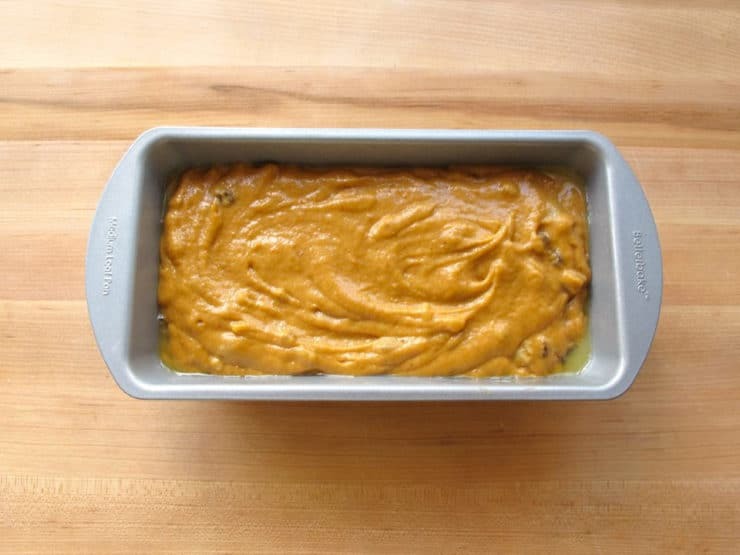 Then pumpkin loaf might actually be a healthy treat. For those looking for a low sugar treat try “the boys” in Boca. They have a killer Mandel bread no sugar added recipe? I made pumpkin spice muffins this morning 🙂 Yum! Just finished and baking in the oven. I used gluten free flour, will this make a difference? Karen good question! I’ve never made this with GF flour but most easy cakes and quick breads like this one do pretty well with all-purpose GF flour substitutes. Please let us know how it works out for you, and what brand you used– it will help other gluten free readers. Thanks! This looks delicous, would love to bake it today. However, it’s 105 here in California. Living in Israel, I ‘forget’ about Thanksgiving – till I saw this recipe. I was able to find canned U.S. style pumpkin puree, decided to swap the raisins with unsweetened dried cranberries to make it really seasonally appropriate. Yum -give it a try! Bread is in the oven right now – smells great! Made your Mushroom Barley soup today and it was delicious! I make something similar….except that I soak the raisins in spiced rum for at least 6 hours. I love this recipe, it’s so rich in flavor, I cannot wait to make it. Is there a Thermomix version of this recipe ? Can I buy pumpkin puree here in israel at the markets? I looked for it and a major super market and couldn’t find it. When I lived in Israel in the 90’s I could never find pumpkin puree, but I could always find pumpkin chunks in the produce department. I microwaved them till they were soft, then mashed them up and used it cup for cup in recipes. Honestly, it’s not that hard, and it’s tastier than the canned pumpkin! Hi Anna, I used a medium loaf pan- 8 1/2 inches by 4 1/2 inches. This cake (although I consider it more of a sweet bread) was a terrific hit with everyone on Sukkot. I’ve already made and frozen more for Thanksgiving! Tori, this cake is FABULOUS! I made this today with my 15-year old son – spending quality time with him and creating this amazing cake = heaven! Made the cake and it was delicious, even my daughter who is a picky eater loved it! Happy you enjoyed it Hannah! I haven’t had any baked pumpkin deliciousness yet this season, for I fear I won’t look back once it starts, but this bread – if it were in front of me, I would not be able to resist. That is an absolutely gorgeous looking cake. I love all things pumpkin this time of year. Looks fabulous! I absolutely love the look of this cake, especially with the walnuts and raisins in it! Looks amazing and so tasty! This pumpkin spice cake looks so moist and beautiful! Your kitchen must have smelled amazing while this was baking! I saw this on the Zabar’s website – it’s a terrific cake! Moist, delicious and I’d LOVE some with a cup of coffee….I’ll make the coffee if you bring the cake! This looks heavenly! Perfect to have with my morning cup of joe! Lovely fall cake! I will need to try-I especially like this recipe due to the addition of the raisins and nuts. It looks very tasty-great post. I love pumpkin and the combination of spices in this cake sound warm and fantastic everything I love about fall and baking. I happen to have a pumpkin loaf in the oven right now. Sounds similar, but sans raisins and nuts. 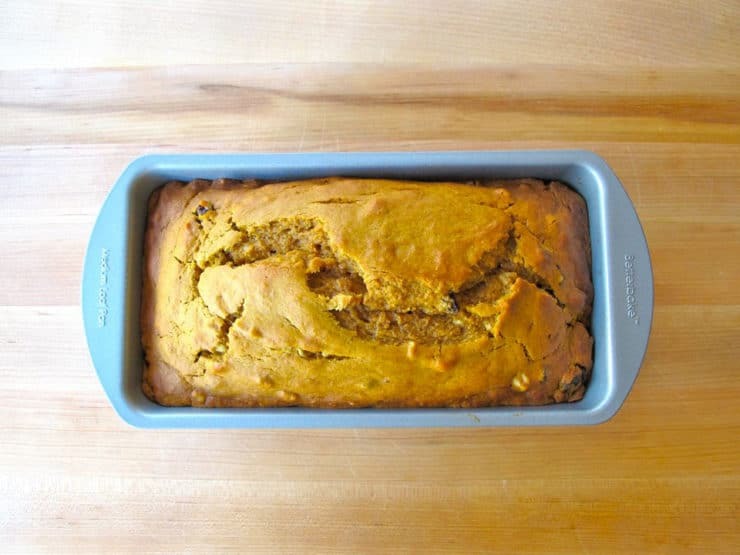 Nice to smell pumpkin while reading your recipe! Now I’m craving all things pumpkin! You’ve incorporated all of fall’s spices and flavor in this wonderful cake! Thanks for the history and the recipe! This look so delicious! I love the idea of making it for Sukkot too! May have to do the same. This look simply delicious Tori! Fabulous pics…love the colors!